For added piece of mind, Proulx Oil & Propane offers The TankSure Program®, a proactive oil tank replacement warranty which you can purchase for only $4.95/month. 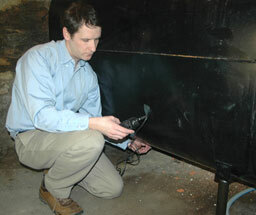 Using ultrasonic equipment, our technician will monitor and test your above ground oil storage tank measuring its thickness and detecting any corrosion or other defects. This can be done every year as part of your annual heating system clean & service. The TankSure® program helps you avoid potential problems such as leaks, before any damage is done to your home or the environment. To qualify for The TankSure® Program, your tank must not be in need of immediate replacement. Once qualified for The TankSure® Program, you will have the benefit of a Tank Replacement payment, up to $1000 to help defer the costs of replacing your tank when it is identified for replacement. Potential savings on your homeowner’s insurance policy. Contact your insurance company.